Conventional thermal decomposition of calcium carbonate for cement-making generates almost as much CO2 as lime. 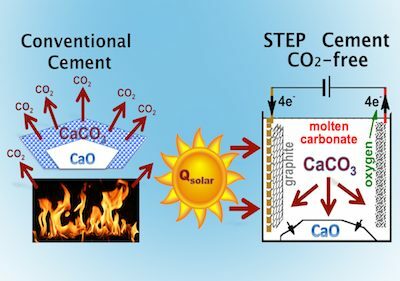 Solar-driven electrolysis of calcium carbonate yields calcium oxide and carbon (or carbon monoxide) and oxygen. Credit: Licht; George Washington University. Strengthened with time, inert with extreme weather, temperature over 1000 degree C, non - disintegrate in saltwater environment, axid, .... There are strong points of polymer cement. Properties are rarely co -exsit in a kind of adhesive are availbale on the market. Since 300 years, loose material is sintered into a stone by a hydraulic binder, cement is called CPA (example Ha Tien cement). It’s heated in a furnace to 14500C, combining 90% limestone with 10% clay, become ingots clinker. Grinding clinker becomes powder, then mixing with clean sand and water, calcined limestone dust was bound clay dust, it makes hardening mortar. After 28 days (actually 3 days), the sandstone is formed, known as concrete.